Rafe Beaumont, fifth son of an earl, uses his irresistible charm with the ladies to glean dangerous war secrets. Now he's putting those skills to the ultimate test: capturing an elusive assassin by seducing his daughter. The problem? She's entirely immune to Rafe's flattery. Suspense, romance, spies, and hedgehogs. That's right, I said hedgehogs. They all play significant roles in this third book of Shana Galen's popular The Survivors historical romance series that follows the post-war journeys to love of a small group of younger sons who were part of a secret military regiment during the war with France. Rafe, the youngest of eight children of an earl, put his good looks and charm to good use behind enemy lines to ferret out secrets for England. When his former commander asks him to take on a new mission, Rafe is ready to put his skills to work but the woman from whom he must obtain information, inexplicably to Rafe, is the first woman in his entire life who seems immune to both his looks and his charm! Frenchwoman Collette Fortier has traveled to London under a false name and false pretense. Collette's father, a feared assassin for Napoleon, is being held prisoner by the new regime and she fears for his life. Only if she obtains a set of codes from England's Foreign Office, will her father's captors release him. Collette loves her father and remembers what their peaceful country life was like before he was forced to carry out Napoleon's demands. She will do anything to save him but she can't be distracted by the charming man who seems suddenly interested in her. She can't imagine why he would be anyway. He flusters her. And when Collette gets flustered, embarrassing things happen, such as blurting out everything she knows about the mating habits of hedgehogs. It's hilarious, endearing, and, ultimately, irresistible to Rafe. I've really enjoyed this series and An Affair With a Spare is another winner. Galen has created two multi-layered, engaging characters with complex backgrounds and placed them in a situation that seems impossible to resolve. The story flows smoothly with a nice balance of both suspense and romance along with action, humor, and heartfelt emotion. As Rafe's background is unveiled it's easy to see why he's become the man his comrades call "The Seducer." As more of the man beneath that facade emerges, I found myself falling for him just as hard as Collette does. As for Collette, I admired her loyalty to her father and her determination to save him, even in the face of seemingly insurmountable odds. I also found her simply charming and couldn't help but smile each time bits of hedgehog mating trivia burst from her mouth. I so wanted these two to find a way to a happy ending. Galen didn't make it easy on them and, I admit, I had no idea how she was going to resolve the issues between them. How she accomplished it was a surprise I didn't see coming (I always enjoy that) but one that I could thoroughly embrace. As usual, the secondary characters are vibrantly portrayed and contribute much to the story. We see more of the horribly scarred Jasper, who hides his burns behind a mask, in this book and that's only ramped up my excitement for his story. It will be next in Unmask Me if You Can, due out on November 6. Are you reading this series? Do you have a favorite book, character, or couple in the series so far? spy Collette Fortier remove their figurative masks. “Will you bring me here again?” she asked. She glanced about his flat, her eyes lingering on paintings and a few of the pieces he’d collected—vases, lamps, and other accoutrement. “It’s dangerous coming here,” she said. She rose, and he did the same. She linked her fingers, looking nervously about. Washed in the golden firelight, she was lovelier than words. And Rafe knew a lot of words to describe women. With her glossy hair piled on her head and her cheeks tinged pink by the wine and the firelight, she looked young but regal. He dared not allow his gaze to dip lower than her chin. “Immeasurably,” he murmured. She stepped closer, and he took her hand. It felt warm and soft in his, and he lifted it to his lips and kissed her knuckles. Then, turning it over, he placed a lingering kiss on her palm. Her dark eyes turned even darker when his mouth skated up her flesh to brush against the skin at the inside of her wrist. She must have dabbed scent here because, above the clean smell of her skin, he also detected the fragrance of juniper. His mouth explored her sensitive flesh until he found her pulse, which fluttered rapidly. She might have pulled her hand away at any time. He held it with the lightest touch, but when he slid his lips higher to the tender skin at the inside of her elbow, she trembled. Rafe’s gaze never left hers when he flicked his tongue out and tasted her flesh. She inhaled sharply. “You are very good at this, aren’t you?” she whispered. Her free hand wrapped around his neck, sliding into his hair. He straightened and she pulled him close. When he released her hand to wrap his arms around her, she twined her arms about his neck and looked up at him. Rafe had never wanted to kiss a woman so badly. And he’d never feared doing so before. The last time he’d tried to kiss her, she had pushed him away. What if he kissed her now and frightened her? What if the kiss ruined the friendship, and she wouldn’t see him any longer? Draven would kill him, but even worse, Rafe would lose Collette. “Kiss me,” she said when he hesitated. “As do I.” She pressed closer to him, and the air caught in his lungs when her breasts pushed against his chest. “Then we stay friends,” he said, voice choked. been so moved, never felt as though he needed a woman like he needed Collette. “I think this is enough for now,” he said, pulling back. That was a rather appealing idea as well. Who the devil cared about restraint and all the rest of that rot? She was in his arms and he wanted her and she wanted him…and if he took her, he might just ruin everything. Because he was not who she thought he was. I have been reading this series. I love Ms Galen's writing because she makes me laugh. For me, romance should always have characters who make me laugh....how could anyone love someone who is a sourpuss? Thanks for the review and the excerpt. I have it on my tbr list and have heard lots of good things about it. I've Shana Galen's books. The series is on my TRL. I've been reading her for years. Love her stories - I need to get started on this series. 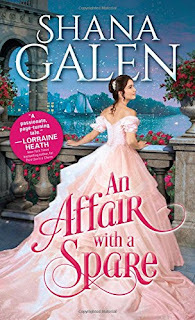 Yes, I've been reading this series, and looking forward to "An Affair With a Spare". Thanks for the excerpt & giveaway. I love Shana's books. I haven't started the series yet, but they are on my TBR list. I love this series! I finished AFFAIR WITH A SPARE a couple days ago! LOVED it! Love Shana's books but have not read any of this series.